Do you love to organize? Have you dreamed of running your own business? You can do both and earn a great salary too! 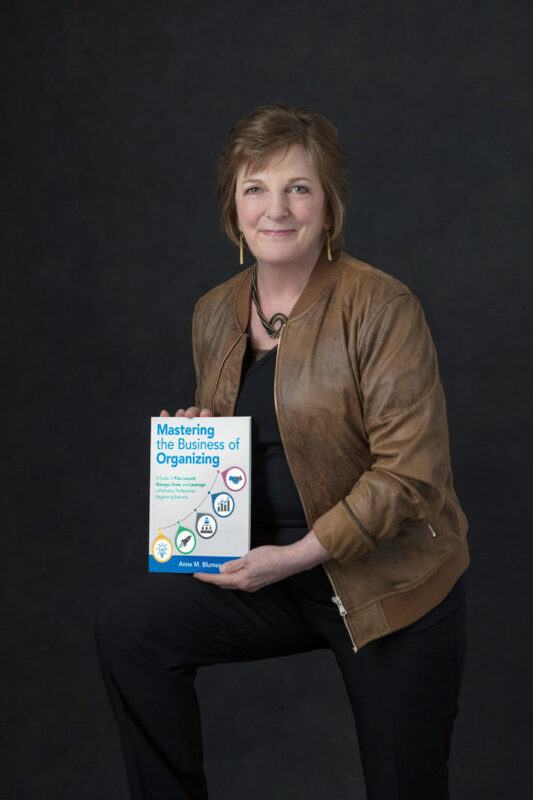 "I wrote Mastering the Business of Organizing A Guide to Plan, Launch, Manage, Grow, and Leverage a Profitable, Professional Organizing Business along with the Institute for Professional Organizers™ curriculum and program because I believe in the immense value of this profession. I want others who aspire to it to represent the industry as experienced and knowledgeable professionals. I also want to share my learning in the hopes that others will benefit greatly from my experiences. You don’t have to suffer through figuring out how to start on your own business and wondering if you are doing it right. You will benefit immediately by learning what took me years and hard lessons to know." There are numerous books on the subject of starting a Professional Organizing business, but none as comprehensive and current as Mastering the Business of Organizing: A Guide to Plan, Launch, Manage, Grow, and Leverage a Profitable, Professional Organizing Business. Note: Mastering the Business of Organizing: A Guide to Plan, Launch, Manage, Grow, and Leverage a Profitable, Professional Organizing Business (2nd ed., revised) is an updated and expanded edition of Get Rich Organizing published in 2009. Provide you with the knowledge and skills you need to become a successful professional organizer and business owner. Help you cut out months or even years of annoying mistakes and learning curves because you need to make money immediately. Show you how to position yourself to attract your ideal client with one hundred marketing ideas. Introduce you to blogging and website development. Instruct you on how to clearly communicate your value and how to charge for your valuable services. Teach you new organizing skills and techniques to work with a variety of client types. Provide you with legal, insurance, and tax information to get you started in the right business entity for you and an understanding of the protection your business needs. Teach you proven processes and systems to organize others and transfer organizing skills. Tell you real client stories that will inspire you to teach others organizing skills and keep you from making some serious mistakes in dealing with clients. Move you to action with recommended exercises and actions found at the end of the chapters. Forms available for you to personalize with your company information saving you hours of time creating on your own. A listing of my top twenty-five organizing products and where to find them so you don’t have to spend time researching. Material to create workshops on paper, time, and clutter so you can immediately market and demonstrate your organizing knowledge. Resources for space planning tools and website development. Up-to-date Professional Organizer industry information and trends. Mastering the Business of Organizing is an essential guide for professional organizers and productivity consultants, and it advances the message and vision of the National Association of Productivity & Organizing Professionals. All this valuable and sought after information and more for $20.99 (plus shipping)! And, your purchase is 100% tax deductible as a business expense. It is a minuscule price to pay for the amazing value you will receive, the time you will save, and the mistakes you will avoid. Just take a look at the table of contents! There are numerous books on the subject of starting a professional organizing business, but none as comprehensive and up-to-date as Mastering the Business of Organizing: A Guide to Plan, Launch, Manage, Grow, and Leverage a Profitable, Professional Organizing Business. “This book is mighty. Anne is the true expert in transferring the skills, framework, and plan for your organizing career. Her methodology and training led me to confidently launch my company, Simplify Experts, and build it into a thriving, multiple six-figure revenue stream. Follow her plan!" "To get a sense for who Anne Blumer is, and how practical and enjoyable this book will be for you, please do read the book’s preface about her journey. You’ll read in there what I know about Anne, as we have worked on the Board for the Institute for Challenging Disorganization together and continue our friendship today. All of it will help you see how right she is to be the one creating this book for you. She has a high sense of integrity, a great sense of humor, lots of compassion, fairness, intelligence and she is inquisitive. Her corporate background has served her very well as she has grown this business. Why make the mistakes people before us have made; learn from their experiences and feel more confident right away with clients and in running and growing your business. This book is unique, as is her education program, in that she not only teaches you about organization but also about running a successful, sustainable, growing business. Trust me, Anne will be by your side, lending compassion along with accountability, as you walk forward together, Mastering the Business of Organizing. " Personal and professional success is the result of more than talent, commitment and hard work. Success requires you to organize your home, your office and your relationships to meet the demanding needs of each. How efficiently you order these important aspects of your life is your key to finding success with ease and is one of the most important tools you have for becoming the absolute best you can be. In Get Organized Today!, myself and 18 other top experts have joined to give you insightful guidance and advice learned through years of study and consulting with their clients and colleagues. These experts share their secrets and give you powerful organizing information and strategies. 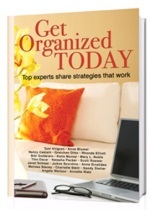 All the organizing professionals you will meet in this book want you to live your life with ease and simplicity. Get Organized Today! is the book you need to help you plan, execute and maintain order in your work, life and relationships. Get Organized Today! Retails for $24.00 and you can receive your signed copy today for only $20.00 plus shipping.